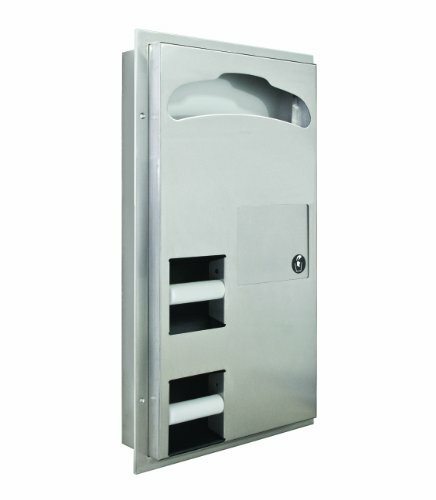 Bradley BradEX Seat cover/dual roll tissue dispenser/waste receptacle combination unit, 22 gauge stainless steel cabinet with exposed surfaces in architectural satin finish. Welded construction with seamless corners and burr-free edges. 22 gauge stainless steel flange. One-piece seamless construction. 1-inch wide with 1/4" return. 18 gauge stainless steel door. Full-length stainless steel piano hinge. Door has two tumbler locks keyed like other Bradley units. 22 gauge stainless steel push flap door. Self-closing with heavy-duty stainless steel piano hinge. Leak-proof molded plastic waste receptacle. 0.88 gallon capacity. Polyethylene spindle, non-removable by user. Partition Mounted serves two compartments. Dispenses 1000 single-fold or half-fold toilet seat covers. Dispenses 4 rolls of up to 5-1/4" core toilet tissue. Unit services 2 compartments, dispensing one roll to each side while holding a second roll in reserve. Hinged access door permits servicing of supplies from one side. Measures 17-1/8" width by 30-5/8" height by 4-1/2" depth. 9021450 PT# 27 Paper Toilet 48/Ca Made by Reckitt & Colman Inc.